Instant Pot Sausage & Kale Soup. If you’re a fan of the Olive Garden and would like to make your own version of Olive Garden’s Zuppa Toscana Italian Soup, then this is it! Loaded with sausages, kale and an amazing creamy sauce, this Instant Pot Sausage & Kale Soup is a keeper. I love making Instant Pot Sausage & Kale Soup. In fact, it has become a true addiction lately. Throughout the winter and into spring, there has been nothing more comforting going in the Instant Pot than sausage and kale soup. I have a husband and teenage son, that believe that a soup must mean a super heathy one with hardly any calories in it, that would give me a dirty look, if I dared to suggest that we have soup for dinner. For the last winter I made it my goal to introduce them to lots of hearty, comforting soups in the Instant Pot, that say “I am on the comfort soup diet and don’t do diet soup”. Now they have a big smile on their faces, when I let them know it is soup for supper. The five of us love our comfort soup and we never have any left and will often fight over the last ladle of soup. If you scroll down to just before this sausage and kale soup recipe you can see the other comfort soups, we made in the Instant Pot. 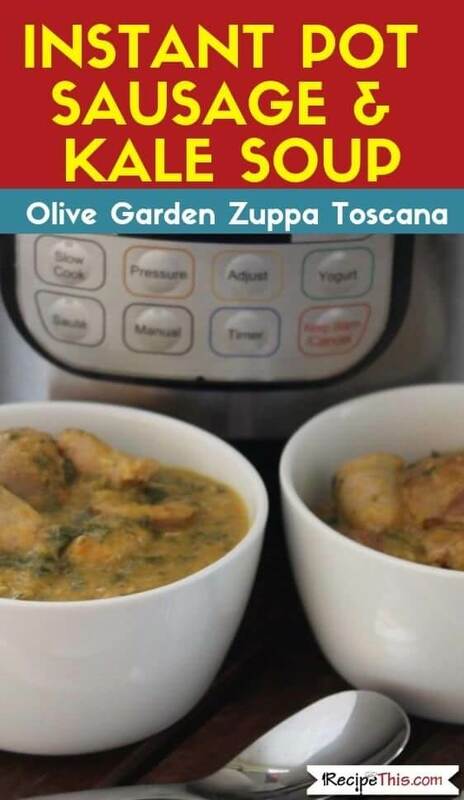 Many of you, when you think of Instant Pot Sausage & Kale Soup will associate it with Olive Garden and their Zuppa Toscana. One of my readers when I was sharing my sausage and kale soup, even mentioned that it reminded them of their favourite meals out at Olive Garden. BUT….I am not American and have never been to Olive Garden, so I can’t claim it to be a copycat of the Olive Garden’s Zuppa Toscana. All I can tell you, is that it’s a comforting delicious creamy soup that is loaded with potatoes, kale and sausages and tastes so good, you will want a second bowl and a third bowl. I can also say that it is healthier than the Olive Garden version as it has some suggestions so that you can make my sausage and kale soup Whole30, Gluten Free, Slimming World or Weight Watchers friendly if you wanted to. How To Make Sausage & Kale Soup In The Instant Pot? The way I make Instant Pot Sausage & Kale Soup, is in the concept of a dump and go Instant Pot recipe. The wonderful thing about my Instant Pot Sausage & Kale Soup, is that it is so easy to make your own version. 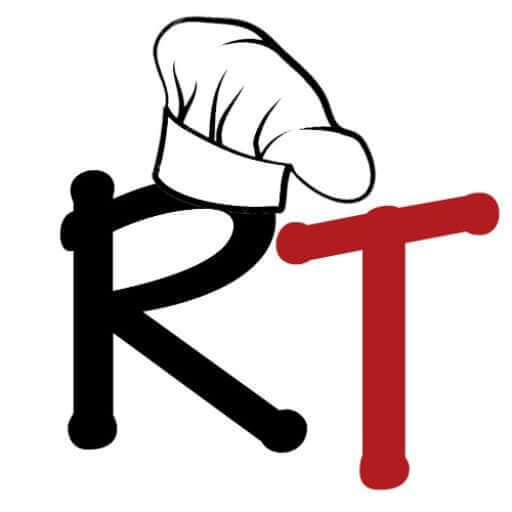 You can swap it for what ingredients you have in your fridge, freezer or pantry and save money in the process. The Stock – You can use vegetable stock, meat stock, stock cubes or go healthy with Bone Broth. When we made our sausage and kale soup, we used frozen Paleo sauce that we had in the freezer, as well as some old turkey gravy that we found in the freezer from Christmas. The Cream – You need something delicious that makes your soup creamy. This can of course be whatever you have available. It could be single cream, coconut milk or whole milk. It just depends what you prefer. I love to use coconut milk in my soup the most. For a low fat diet you can use quark or fromage frais. The Sausages – We all love different types of sausages in our sausage and kale soup. We used our favourite British ones that are pork sausage and leek. BUT you could use any. If you’re Paleo or Keto I would recommend these chicken sausages from US Wellness Meats. White Wine Is Optional – I consider white to be an optional ingredient. It is not essential in soup, but it gives it such a lovely flavour. Just like it does when you add cheese to a sauce. It makes it taste better, but you could also leave it out if you don’t like cooking with wine. I promised you comfort soups in the Instant Pot and here they are. These are our favourite Instant Pot soups for a comforting filling supper with your family. Plus, what I love the most is that these Instant Pot soups can focus on using up your leftovers and saving money. Our ham and bean soup for example, was made while camping in France and it was so easy to make. Peel and thinly dice the garlic and onion. Sauté it in the Instant Pot with the olive oil until the onion has softened. Deglaze the Instant Pot with the white wine and mix well. Add in the rest of the ingredients apart from the coconut milk. Also add in a cup/250ml of cold water. Place the lid on the Instant Pot, set the valve to sealing and cook for 5 minutes on manual. Manually release pressure, stir and add in the coconut milk. I used 1 frozen container of my Paleo sauce as well as leftover turkey gravy. You can mix and match with what you have in or use vegetable bone broth. You can sub the coconut milk for whole milk, single cream, quark or even soft cheese, depending on what you like.